Amir Khan reacted to taunts about his personal life by throwing water over future opponent Phil Lo Greco as the pair clashed at the press conference ahead of their April 21 bout. han is returning to the ring for the first time in almost two years after a period of well-publicised marital difficulties as well as a spell in the ‘I’m a Celebrity’ jungle. Lo Greco, who has won 28 of his 31 fights, mocked Khan’s career trajectory, insisting he had been on a “losing streak” in and out of the ring since losing his last fight against Saul Alvarez in May 2016. Khan said: “I will train like it’s a world-title fight. Greco says maybe I’m past my best. I’m 31 and at the peak of my career. 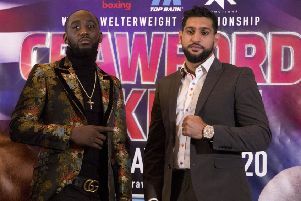 Cynics may suggest Khan’s antics were designed to reignite his public profile since his signing with promoter Eddie Hearn, who has made no secret of his desire to make a domestic super-fight against welterweight rival Kell Brook.